The facility set defines those network components (e.g., conduits, Subcatchments, pumps, junctions, etc.) that will be considered during the next InfoSWMM H2OMap SWMM InfoSWMM SAsimulation. The facility set may include the entire network model or a subset of network components. By default, only facilities in the active facility set are displayed in InfoSWMM H2OMap SWMMInfoSWMM SA . Facilities that are not active (i.e., those not in the current facility set) are removed from the map display. However, the user could also view the de-activated (inactive) network components by checking the option from the Display Settings Display tab of Preferences Preferences dialog box. Define active networks, i.e., the components in InfoSWMM H2OMap SWMM InfoSWMM SA project that you want to include in your simulation run. In conjunction with the Scenario Explorer, to model “what-if” conditions/scenarios to better understand your system, for conducting worst case scenario experimentation, and for future development planning etc. Active Network If this option is assigned to a scenario, it implies that the scenario will take the facilities that were active immediately before the scenario is activated. In other words, if a Scenario has its facility set defined as Active Network, the modeler could activate only the facilities in the project that s/he wishes to consider in the scenario using one of the Facility Manager’s tools/options and then activate the Scenario. Note that loading a scenario that has the “Active Network” option will not change the current active facility set in the project. In other words, the facility set included with an “Active Network” will vary every time according to the *active* facility set created from the Facility Manager. Entire Network When this option is chosen InfoSWMM will always include the entire network in to the scenario. Therefore, irrespective of the facilities that are active (in the current facility set) at the time you load the scenario, that facility set will be replaced with a new facility set representing the entire suite of network components in the open InfoSWMM project. Query Set When this option is chosen InfoSWMM will evaluate the database statements (defined in your query set) specified and searches for the network components meeting those criteria at the time the scenario is activated, and includes these data elements in to the scenario’s facility set. 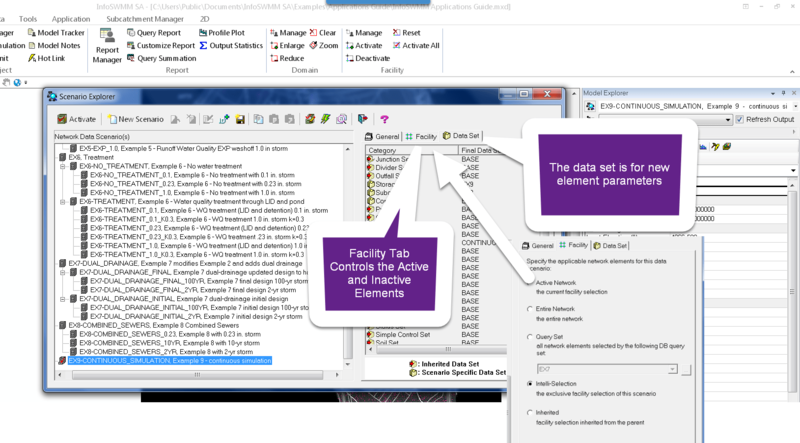 Those facilities will be displayed and all facilities not meeting the criteria used in the DB Query statements bundled in the query set may be disregarded from the simulation and will be removed from the map display. Note that, this option is useful for creating facility sets based on database attributes. As an example, you could assign drainage zones designations to all components in the project and then specify database query statements to select and include components in each drainage zone in to different modeling scenarios. Inherited A Scenario can now inherit its Facility selection from its ancestor which possesses a non-inherited facility definition. Launch Scenario Explorer by selecting Scenario Explorer from theInfoSWMM H2OMap SWMM InfoSWMM SA Scenario Menu or by clicking the Scenario Explorer button ( ) on the InfoSWMM H2OMap SWMM InfoSWMM SA Control Center Toolbar Standard Toolbar . Choose the Scenario that you want to create a facility set for by clicking on it. Make sure that this scenario or its children are not presently active. Always remember that Active Scenarios or their Parents cannot be customized. To customize the Facility sets for active scenarios you would first need to de-activate the scenario i.e., have another Scenario active. Click on the Facility tab on the right window of the Scenario Explorer. The Scenario Explorer dialog box will have the look shown above. Choose the facility creation option you wish on the Scenario Explorer dialog box. Click on the button at the top of your Scenario Explorer dialog box to save and exit out of your Scenario Explorer dialog box.